The Stratford Shakespeare Festival will be doing two screenings of the 2011 film of Twelfth Night, directed by Des McAnuff, featuring Ben Carlson, Brian Dennehy and Stephen Ouimette. An afternoon screening is for invited students and teachers from the Regent Park area. It will be preceded by a workshop with two actors from the production, Cara Ricketts and Mike Shara, and followed by a question and answer period. An evening screening will be open to the public and will also be followed by a Q&A with Cara Ricketts and Mike Shara. 12:30 p.m. Screening of Twelfth Night for students from schools in the Regent Park area. Sunday, October 14, at 3:30 p.m. The Festival presents a screening of the 2011 production of Twelfth Night, directed by Des McAnuff, featuring Ben Carlson, Brian Dennehy and Stephen Ouimette. Thursday, October 25, at 5:30 p.m.
Lucy Peacock will deliver an address titled Work, Prayer, Carnival: My Journey with Shakespeare. Introduction by Prof. Paul Yachnin. Sunday, November 11, at 2 p.m. The Festival presents a screening of the 2010 production of The Tempest, directed by Des McAnuff, featuring Christopher Plummer as Prospero. 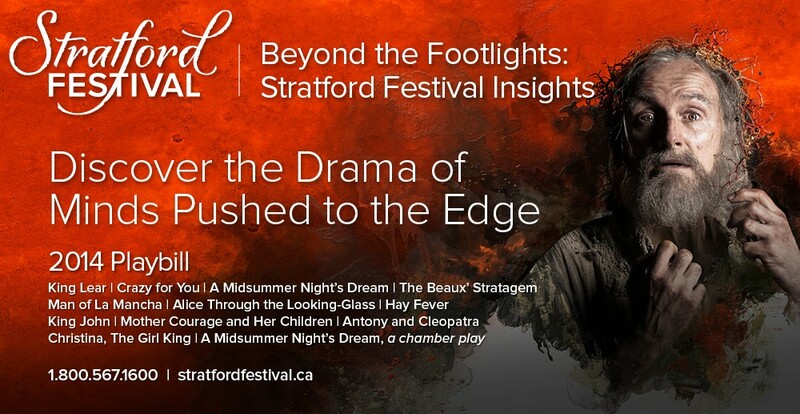 This entry was posted in 2012 Season and tagged Antoni Cimolino, Ben Carlson, Brian Dennehy, Cara Ricketts, Christopher Plummer, Des McAnuff, Lucy Peacock, Mike shara, Stephen Ouimette, Stratford Festival, Stratford Shakespeare Festival, The Tempest Film, Twelfth Night Film by Stratford Festival. Bookmark the permalink.